(Phys.org) -- ExoHand, a glove designed to double the gripping power of the human hand, was a key attraction at this week's Hanover Trade Fair. So much for mechanical graspers or mechanical claws: one viewer who watched the demo said it was un-nerving, but the glove is designed to do quite the opposite than un-nerve. Once worn on the users hand, it provides enhanced dexterity in picking up difficult objects and provides power when needed too. The engineers responsible for ExoHand worked with the objectives to enhance the strength and endurance of the human hand as well as to extend the hands scope of action. As a showcase mechanical exoskeleton, all the joints and drive units are located outside the hand in the form of the exoskeleton. Fingers can be moved and strength amplified in this device also described as an active manual orthosis with sensitive fingers. 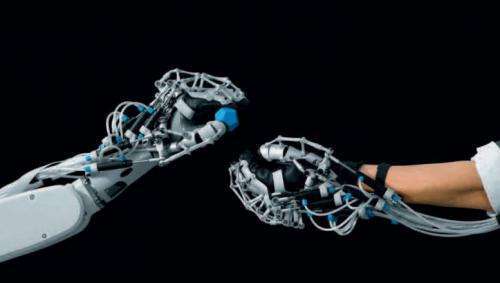 The operators hand movements are registered and transmitted to the robotic hand in realtime. This orthosis can be fitted over the human hand and also over an artificial hand made of silicone. The company foresees ExoGlove in remote-manipulation scenarios too, where handling items poses risks. In this instance, the users motions would be emulated by the robotic hand away at a safe distance. As such, it would enable performance of tasks in hazardous areaswhether because of natural disasters, accidents, or within scientific labs. Looking into that future, Festo draws on experience in industrial training and education programs, and it recognizes an aging work population where retirement is taken in later years than before and where older workers in assembly line jobs could be helped through a device assisting them with tasks demanding endurance or strength or both. The power amplifier, as it is also called, might assist any workers in repetitive tasks that easily lead to fatigue. Rehabilitation for stroke patients has also been suggested as a possible application. If connected to a brain-computer interface, it may help stroke patients suffering from paralysis to get a connection between hand and brain. According to Festo, the company has entered into a collaboration with the Tübingen University Hospital as part of the Bionic Learning Network. That network ties in Festo with universities, institutes and development companies working on technology and industrial applications. Until some bright spark puts the exo hand on backwards on the wrong hands while testing higher power - aargh painful ! Although the trademark holders of the catchy new moniker used in this story don't seem very eager to acknowledge the debt, there's already a word for this device. It was coined by the man who invented them seventy years ago, science fiction author Robert A. Heinlein. It's called a "waldo". I suggest they might want to read the short story of the same name, written in 1942, in which the author described further ingenious applications in addition to the ones outlined here. maybe if they use hydraulics with magnetic fluid like used in shockbreakers for luxury cars, with very smooth dynamics. ^Eventually this kind of stuff could use actual artificial muscles, perhaps carbon nanotube ones, and the hands would have artificial tendons going to the arm muscles. I wonder how durable that arm is though. If he did a sharp punching movement, instead of slow fluid movements, would it pull the copying arm out of the wall? would it pull the copying arm out of the wall? Probably not as the actuator speed is limited by the motors involved. But feedback is a real problem. We did work with a haptic feedback device once of which there were two kinds (manufactured by the same company and with the same API): a cheap/desktop kind (cheap meaning about 4000 dollars) and a large/expensive kind (about 50000 dollars). When they tried to do telesurgery to find out whether lag would be an issue over the net they failed to realize that the force feedback settings of the two were different. Almost broke the wrist of the guy handling the large gizmo. "enhance the strength and endurance of the human hand"
Just in time for the coming election. Every politician should have one (or two) to eliminate limp handshakes and claims on taxpayers' money for Repetitive Stress Injuries.